Highbridge Music, which publishes his works. News: PREMIERE OF A SONG IN CATALAN - 'LA MEVA TERRA'! Details of published CD, DVD, Video and LP recordings of the works of Howard Blake. Use the search form to filter results, search by keyword, title, artists or related opus number. A full list of all of Howard's works which have been recorded (though not necessarily published or made available for sale) can be found here. Only show Howard Blake's work (hide compilations)? 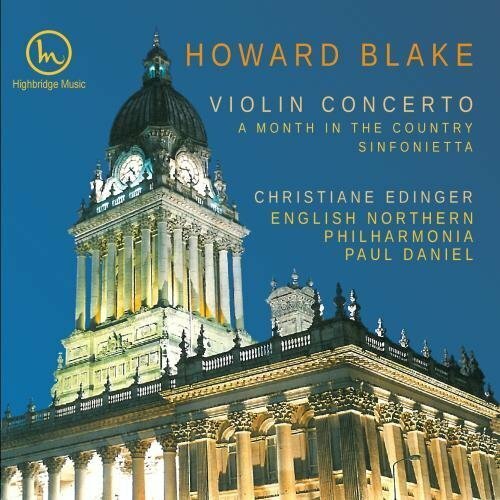 Christiane Edinger is the soloist in Howard Blake's emotionally-charged Violin Concerto, an inspired performance "caught on the wing" to join a select group of very special first recordings. Conducted by Paul Daniel with the English Northern Philharmonia, the album includes the eloquent and moving suite for string orchestra, "A Month In The Country", the film which starred the young Colin Firth and Kenneth Branagh and concludes with the bold and original "Sinfonietta For Brass". Originally recorded and released on ASV, this version of the CD was digitally remastered and re-released in 2012. Copyright © 2006, 2010. All Rights Reserved.